If you are not sure about how important it is to reduce cholesterol, then you should consider that high cholesterol will ultimately lead to heart disease. It is estimated that heart disease takes a life every 33 seconds! If that isn't serious enough, then consider what life would be like after a stroke. High cholesterol is a leading cause in both heart disease and stroke. If they don't kill you they can certainly leave you with a less than desirable quality of life. Reducing cholesterol is one way to minimize the risks significantly. When you fail to reduce cholesterol the excess builds up in the arteries and causes them to become narrow and hardened. Depending on where in your body this happens will determine whether you suffer a heart attack or stroke. If the vessels leading to brain become so narrow that blood cannot flow freely then you can suffer from a stroke. This can leave you partially paralyzed or unable to remember how to do everyday tasks, even how to speak. Cholesterol comes in two forms. Serum cholesterol is made by the body and serves an important purpose in producing new cells and protecting existing ones. Then there is dietary cholesterol, which comes from foods and is not an inherent part of the blood composition. Even by not consuming any dietary cholesterol at all it is possible to have too high serum cholesterol, based on genetics. You can reduce cholesterol of either kind by watching your diet, exercising to raise the level of good cholesterol and monitoring your progress at least annually. Most heart disease can be prevented by controlling cholesterol, blood pressure and diabetes. 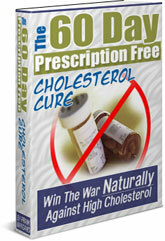 To learn more about how to reduce cholesterol without prescription drugs, read The 60-Day Prescription Free Cholesterol Cure.